Microsoft has announced a version of the Xbox One aimed at "digital natives" (basically, it doesn't use discs). The Xbox One S All-Digital Edition is identical - inside and out - to the current Xbox One S console except for a lack of a drive. 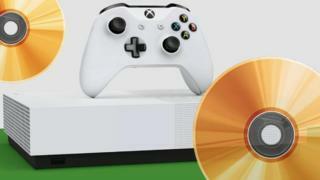 Due out on 7 May, the makers want the £199 device to appeal to people who have "grown up without the discs". "Yes... reluctantly," says the owner of the Xbox One UK community Jon Pettman-Tideswell. He tells Radio 1 Newsbeat the majority of people discussing the announcement in the 30,000-strong online group see it as "moving forward". "There is that nostalgic thing of physically owning the product. But in reality, is the stuff I play digital? Yes. Do I update digitally? Completely." "If I could buy a console and have enough storage to hold 10-20 games then I'd be happy to do that," he tells Newsbeat. "I wouldn't want to have to keep buying more physical games and fill up more shelves." It'll also come with a discounted subscription to Xbox Game Pass, which offers a library of more than 100 games for a monthly fee. "They're effectively squeezing as much revenue as they can out of something they've already spent money on," Jon suggests. "It's about testing the water for what the next generation of gamers are looking for. It'll be an interesting experiment..."
Joe says the digital-only feature alone, without major upgrades, isn't enough to sway him from his current allegiance to Sony's PlayStation. "I just think this should have been released instead of the standard Xbox One S," he says. "There is no need to have multiple consoles within the same generation." Sony recently announced its next console, unofficially titled PS5. It will be backwards-compatible with previous models' games and will feature 8K resolution and "near non-existent" loading times. Sony hasn't referenced ditching the disc drive just yet, but it's thought the console will be out in 2020. With that in mind, Joe says he "can't imagine" he'll end up buying the new Xbox. "The appeal is definitely there so I won't say no, but with new consoles around the corner I don't think I can see myself spending so much on something I won't use long-term. "Good idea, but bad timing for me." "Microsoft have been keen on pushing a digital solution, so it's reflective of where they're going and the Xbox One is coming to the end of its life-cycle. "But is having no drive a gimmick? Arguably."